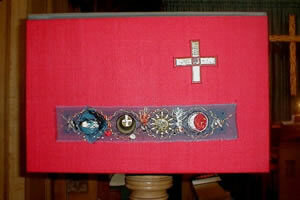 These are memorial pieces and were presented to the church for use during the Pentecost Season. The pulpit fall illustrates, in the main image, the Pentecostal fire and wind and the flames branching out to each disciple. The Holy Spirit descends as a dove. The images in the lower section refer to "speaking with tongues" and are references to the subject of the gift made in secret languages or "tongues". The four "M's" refer to the initials of the dedicatee and to the Millennium year during which the work was created. 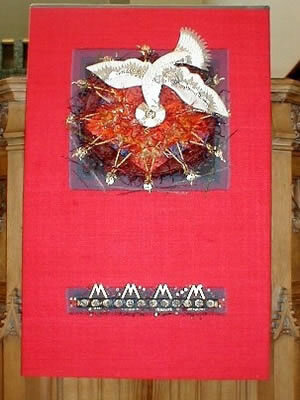 The lectern fall continues the theme of the Pentecost and illustrates the passage concerning (from the left) young men seeing visions (the eye at the left) and old men dreaming dreams (second subject) the sun turning black and the moon turning red as blood (right). These images are interspersed with blood, fire and smoke.